According to the paper, Google will soon roll out the feature to select Local Guides, the app's user-generated content participants. A wider release will be dependent on Google's progress in testing the navigation mode. 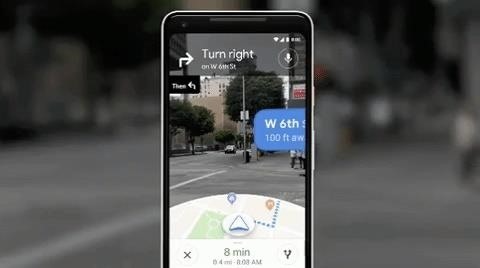 Originally unveiled at Google I/O 2018, the AR navigation mode for Google Maps uses a combination of standard GPS location tracking with a visual positioning system that identifies landmarks for specific orientation within the physical environment. It's also worth nothing that with Google's existing Street View feature, Google Maps already possesses a comprehensive photographed map of the world for visual orientation. The current preview build overlays giant arrows in the app's camera view as navigation prompts, with the app's familiar red pin anchored on the users' destinations when they arrive. The app also displays a flurry of Google-colored (red, blue, green, and yellow) dots on top of the visual environment, which represent points of interest that the app is investigating. In the interest of user safety, the app also employs tactics for ensuring that users are not too distracted to remain aware of their environment. The app will advise users to hold the phone down as they walk and even dim the screen, which will also decrease the tax on battery and data usage. 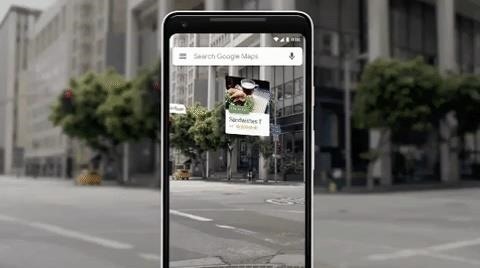 Whenever it does make its way to Google Maps, the AR navigation mode will serve mostly as a preview of the benefit of smartglasses to the average consumer. Such a feature will be much more useful when virtual navigation prompts and points of interest appear directly in the users' field of view, rather than on a touchscreen held in front of their faces.